Dublin (AFP) - Britain's vote to leave the EU has sparked a debate after Irish nationalists called for a referendum on reunification less than two decades after Northern Ireland's historic peace deal. After last June's Brexit referendum outcome, Irish nationalists instantly began clamouring for a so-called border poll to allow people in Northern Ireland to vote on Irish reunification. When Britain leaves the European Union its only land border with the bloc will be between Northern Ireland and the Republic of Ireland, which people can currently cross freely. The impact of such a change has prompted Brussels to make Ireland once of its top priorities for Brexit negotiations, less than 20 years since a hard-won peace accord ended decades of violence in Northern Ireland. EU leaders at a summit in Brussels last month said Northern Ireland would be automatically welcomed back into the bloc if it ever voted to become part of the Republic, although the prospect is currently far off despite rallying cries from Irish nationalists. Ireland's Foreign Minister Charlie Flanagan told the BBC this week that the Brexit vote "may well" have made a referendum more likely but dismissed the prospect saying: "That time is not now." "I don't believe that a debate now on the merits or otherwise of a united Ireland is timely or appropriate. "I don't believe that we should conflate the issue of the reunification of Ireland with the withdrawal of the UK from the European Union." Brexit has however brought back reunification as a talking point, in a society where bitter political, historical, cultural and socio-economic divisions between pro-British, mainly Protestant, unionists and pro-Irish, mainly Catholic, nationalists are still readily apparent. In the United Kingdom's June 2016 referendum on its EU membership -- in which British, Irish and Commonwealth residents could vote -- some 52 percent voted to leave the bloc. But within Northern Ireland, on a 63 percent turnout -- the lowest in the kingdom -- some 56 percent voted for the UK to remain in the EU. 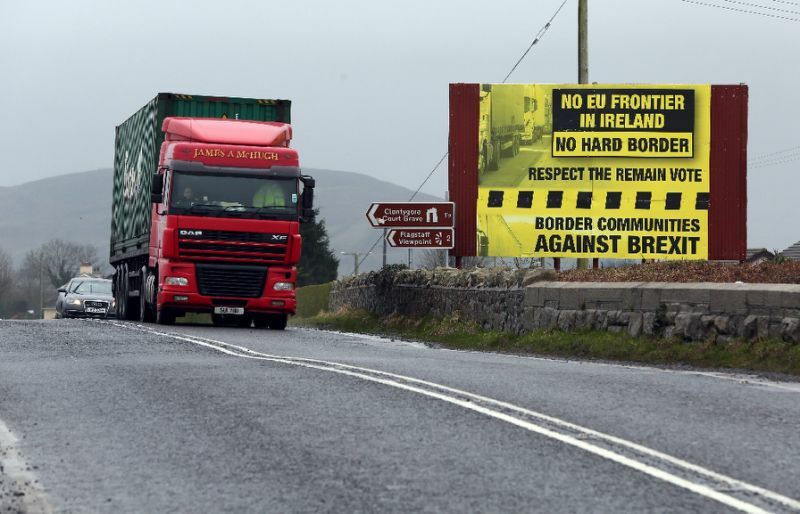 The Irish nationalist party Sinn Fein, once the political arm of the Irish Republican Army paramilitary group, has called for a border poll in the next five years. "Brexit has changed everything," Sinn Fein European Parliament member Matt Carthy told a recent party gathering. "The prospect of the north being dragged out of the European Union against the democratically expressed wishes of people there has horrified citizens across the political spectrum," he said. The possibility of a referendum is provided for in the 1998 Good Friday Agreement, which ended three decades of armed conflict in Northern Ireland. However, any such referendum could only be held if the British government approved the move. Unlike in Scotland, where opinions are more evenly divided on seceding from the UK, the polls in Northern Ireland indicate overwhelming support for the union. The most recent one in September showed 63 percent in favour. From its creation in 1921, Northern Ireland's in-built Protestant majority has always expressed an antipathy towards what it regarded as a southern Irish state too closely aligned to the Catholic Church. But, as former British prime minister Tony Blair, who negotiated the 1998 peace accords, said Saturday, Brexit marks the first time that the UK and the Republic have "not been in step with each other". But Irish nationalists argue that as a majority in Northern Ireland voted Remain in the EU referendum, including many unionists, this in itself is enough to warrant a testing of the waters. Their case was bolstered in Northern Ireland regional assembly elections in March when a nationalist surge ended the unionist majority for the first time and further victories in the June 8 UK general election could help. According to Dublin-based political commentator Johnny Farrell, a lot will depend on the shape of the Brexit deal. "If things go badly for Britain then the situation could change very, very quickly because people in Northern Ireland could decide their economic interests are served better by remaining part of Europe by voting for a united Ireland," he said.